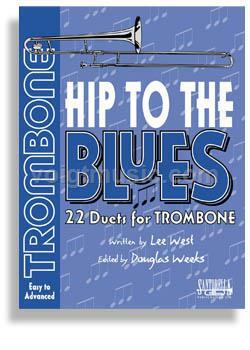 Hip To The Blues published by Santorella Publications is a series of 22 jazz duets edited by Douglas Weeks, that combine the best elements of education, playability and musical fun. These lyrical melodies are unique to the industry. The CD is recorded in a “music minus one” fashion with the duet being played in entirety (both parts) if your stereo is evenly balanced. Move the balance to right or left channel to isolate the top or bottom (1st or 2nd) part and play along with Nick Lane, one of the best studio trombone players in Los Angeles today. Get ready to enjoy these “Hip” Lee West “Blues”titles; Foolin' Blues • Working Man's Blues • Too Blue to Cry • Sittin' Back • Floppy Dog Blues • Can't Decide • Makin' Your Acquaintance • 8th Street Shuffle • Avenue Blue • Flamingo Way • Everything's Blue • Tom Cat Talk • Tongue in Cheek • Impromptu Blues • Old Shoe Blues • Minor Difficulties • Ain't No Stoppin' • Hip to the Blues (Take #1) • Blue Wind • Blue Zambu • Under Your Spell • Baroque In Blue About Nick Lane Nick Lane has been active in the Los Angeles music scene for over twenty five years. He joined Maynard Ferguson’s Band after graduating from Bostonâ€˜s Berklee College of Music and remained on the road for three years before moving to Los Angeles. He continued touring while based in L. A. with Rod Stewart, The Who and Tom Petty & The Heart Breakers. Nick Lane continues to perform with Etta James, Chicago, Shakira, Alejandro Sans and has even performed withJennifer Lopez. Nick has also been featured in a special PBS broadcast about “the blues” with T-Bone Burnett. Nick remains active in the commercial recording fields for movies, television, commercials and has recorded with such Pop artists as; Macy Gray, Tim Mc Graw, Baby Face, Destiny’s Child, The Offspring, The Wallflowers, Fast Ball, Green Day, No Doubt, Natalie Merchant, Everclear, Barbara Streisand and Joe Cocker. Nick has recorded with such Jazz artists as; Rick Braun, Jeff Golub, David Benoit, Dave Koz, Kombo, Greg Karukus and Warren Hill. Nick’s popular “lounge jazz” CD performed with baritone saxophonist Greg Smith and an organ trio is recorded on the Oakland Stroke Label.